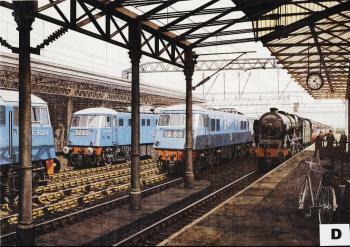 Locomotives of the old and the new railways meet at Crewe at the dawn of the swinging sixties. Rebuilt 'Royal Scot' 4-6-0 No. 46142 The York and Lancaster Regiment represents the old order. On the left, lines of sparkling new Class A 3300hp electric locomotives wait in the wings to take over. In their 'electric blue' livery with cut-out steel numerals and cast alloy BTC rampant lion symbol they present an aggressively up-to-date sight. A highly visible show of modernisation in action. 'The New Railway' was the contemporary description of the electrification of the southern half of the West Coast route. And new it certainly was, although the engineers were grafting the white heat of 1960s railway technology onto a line originally carved out 130 years previously by the muscle power of thousands of navvies under the direction of Robert Stephenson. It was the biggest such scheme that had then been undertaken in this country, and the first major electrification to use the 25kV 50 cycle ac overhead system. This new system, which was higher powered, more economical, and took account of post-war technical advances by the other European railways, especially France, had been chosen as the standard for all future electrification by the British Transport Commission on 6 March 1956. The 1500 volt dc method - preferred up till then - was dropped. The New Railway was achieved piecemeal, and slowly, but when it finally arrived it proved to have been worth waiting for. The Crewe to Manchester and Crewe to Liverpool legs were electrified first - on 12 September 1960 and 1 January 1962 respectively - before the wires began to creep southwards to Euston. As the posters advertising the New Railway went up near the completion of the work, a name started to appear more and more often - Inter-City - its first use as a brand name for all that's fastest and best on BR. And when Inter-City took the wraps off the first full electric timetable between Euston, Crewe, Manchester and Liverpool on 18 April 1966, it unveiled the future. Sleek, powerful new electric locomotives hauling the newest carriages on fastest ever schedules. Schedules that included the first British 80mph start-to-stop timings and an all-round speed-up that made 100mph running commonplace. Customer reaction was electrifying too: in the first three months the number of people using the route went up by 61% and soon one in four air passengers had turned to the train. Eleven months later, the line to Birmingham and Wolverhampton was electrified and, after some years waiting government approval, the wires were extended north to their logical destination, Glasgow, reached in May 1974. The steam-age layout at Crewe remained unchanged by electrification until it became obvious that the station had reached the limit of its operational efficiency with existing equipment. Between 1983 and 1985 a £14.3 million programme completely re-signalled the area and re-modelled the track layout so expresses could fly through at 80mph rather than crawl through at 20mph. The station itself was not neglected and is now a cleaner, brighter place. The ideal environment for the customer who has to change at Crewe.